However, after that they had disobeyed God, they could no longer remain in Eden. Life became tougher and a lot of things were affected by that one decision. But the most important thing that changed was the relationship that they had with God. God being holy could no longer commune with them they way He used to. And God new that if He left us in this fallen condition, we would all be lost. This is why Jesus came: to repair this broken relationship between us and God. So think of Christianity as a relationship and not a religion. Religion tells you to do this and that, but in the relationship with God you obey and live a life that is pleasing to God out of love and not just because its the law and that is the system that you have to follow. 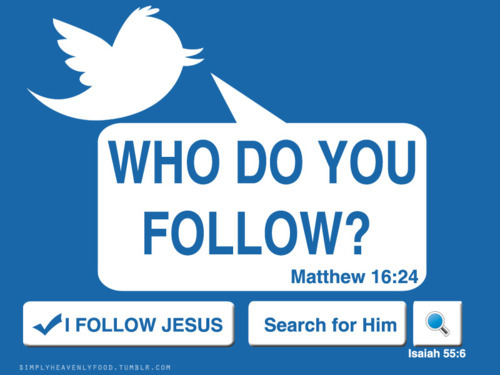 Jesus wants us to follow Him. How do we do that? Read the bible and see how, when Jesus reacted to certain situations. See the principles behind what He is doing. For example, Jesus would pray very early in the morning every day. Remember Christianity is a relationship and prayer is communication with God. Any married couple will tell you that if they didn’t communicate with their partner well and regularly and in love, the relationship would be doomed before you know it. So, when you read the bible, ask yourself HOW you can apply the principles that you are reading in your daily life and ask the Holy Spirit to guide you and help you focus on those principles. Walking in the guidance of the Holy Spirit is how we properly follow Jesus!